Pura Vida. Costa Rica’s national motto means “pure life” – and pura vida is exactly what you’ll experience as you explore the wonders of this tropical, exotic paradise. Over the course of our nine-day cultural and language adventure, you will immerse yourself in a country rich with fascinating wildlife, outdoor adventure, and some of the most beautiful rainforests the world has to offer. 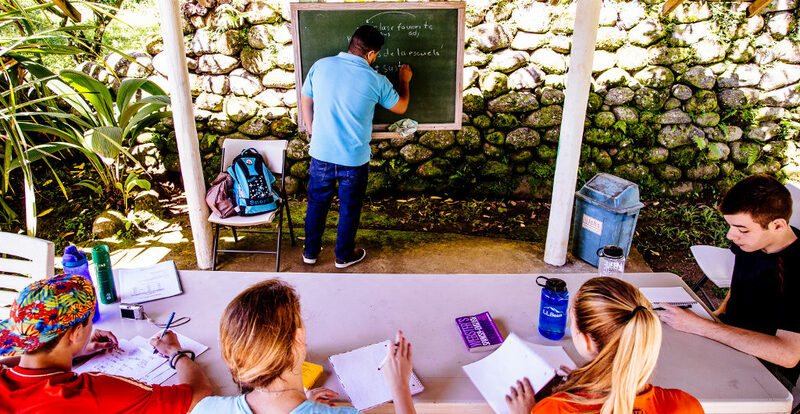 You will spend a week honing your Spanish skills at an engaging and interactive Costa Rican language school where your outdoor classroom is canopied by the green, verdant rainforest around you and visited by the occasional toucan. 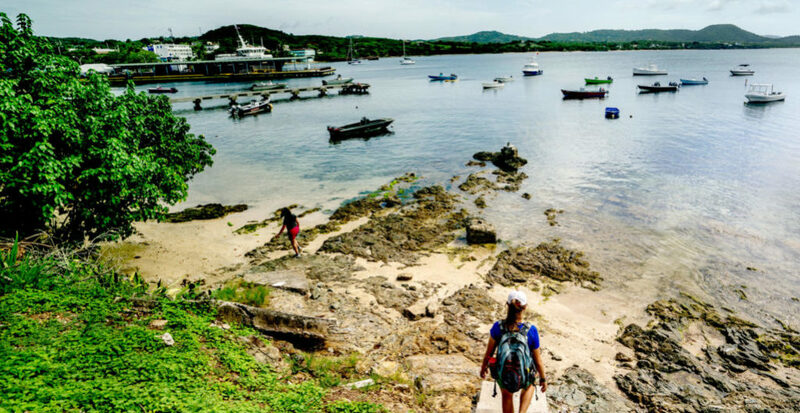 What’s more, you’ll dig into meaningful service projects alongside locals in the lively and unique communities you visit. We’ll jump right into our adventure with morning Spanish classes in the lush, beautiful town of Turrialba, surrounded by high mountains and vibrant forest. With the guidance of our Spanish teachers, we will learn useful vocabulary and use new tools to communicate with locals and absorb Costa Rican culture. Our experienced teachers work creatively to make sure students are not just engaged, but having fun as the Spanish language becomes both comfortable and familiar. 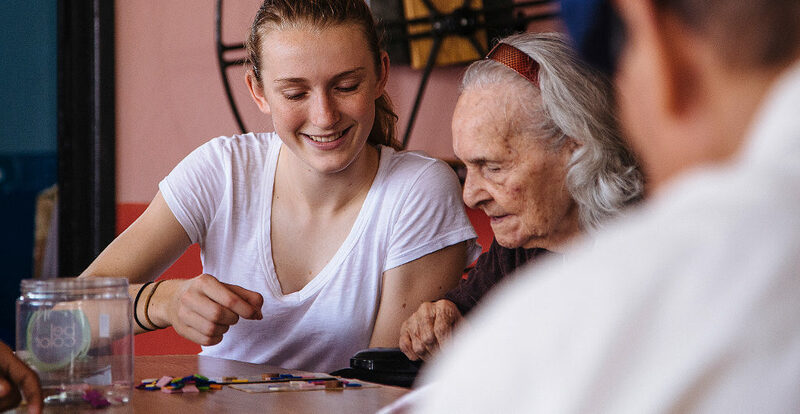 Our afternoons in the Turrialba area will be spent putting our new skills to the test as we spend time volunteering at a local children’s home, a senior home, and a center for indigenous women. Our time volunteering will be very interactive; we’ll play games, converse, and help the residents of each place with tasks (be it homework for the young kids or cleaning for the seniors). On an afternoon off from service, we’ll head to a local waterfall/swimming hole and hit the lively Turrialba market to collect savory local eats and perhaps some souvenirs! For our final days together we’ll head to the Pacific coast to explore Manuel Antonio National Park and its astonishing wealth of wildlife and natural beauty. 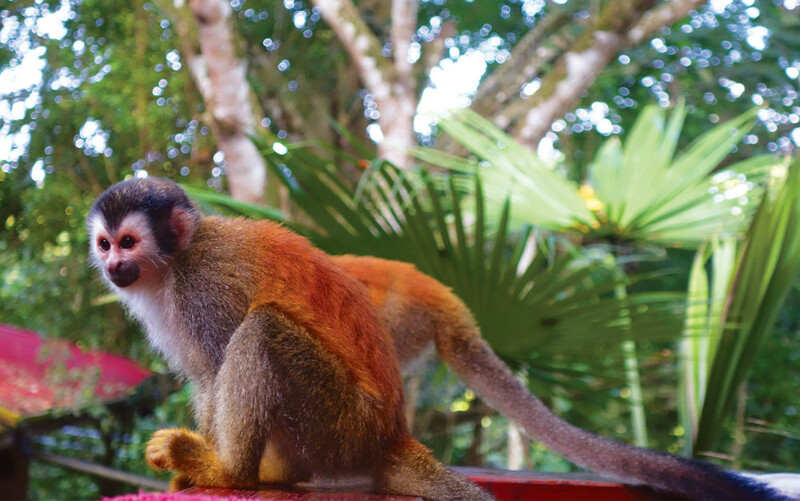 We’ll take a guided tour of the Park with rangers, get to know the resident sloths, and enjoy the antics of the three species of monkeys in the area. We’ll spend a morning soaring through the trees on Central America’s longest zip line, and swim in warm, clear Pacific waters! A farewell dinner in San Jose and a final evening of pura vida with new friends will round out our rich and full Costa Rican adventure! How physically challenging is CRLS? Given a physical challenge rating of 2 (out of a maximum of 10), we consider CRLS to be a beginning language & service trip that any moderately fit, motivated student can successfully complete. Though the majority of our service projects will not be too physically demanding, students will engage in moderate hikes throughout the trip. While the physical challenge level of this trip is relatively low, students can expect to be challenged intellectually (appropriate to their level of proficiency) during their Spanish language classes. Please note that all of Apogee’s Challenge Levels are not scientific and are subjectively calculated by the Apogee staff. How much Spanish does my child need to know prior to his or her trip? None – Spanish-language experience is not a prerequisite for CRLS. This trip is designed to accommodate a wide variety of Spanish-speaking levels – from none at all to fluency. Upon arriving at the Spanish school, each student will complete a brief placement evaluation. Students will be placed with teachers who will work specifically with his/her level – in groups of no more than six students. Students with no previous Spanish-speaking experience are encouraged to dive into this experience as well. How many hours of Spanish language instruction will I receive on CRLS? How many hours of community service will I earn? While at our language school, students will spend 3-5 hours a day receiving instruction. This amounts to approximately 15 hours of Spanish instruction over the course of the trip. When performing service, students will spend between 3-4 hours a day on projects for a total of 10 to 15 hours and will receive a letter verifying the service at the summer’s end. Apogee’s tuition costs are meant to be all-inclusive and include all meal, accommodation, and activity fees. The most significant additional expenses on our Costa Rica Language & Service trip will include travel to and from San Jose, Costa Rica, a sleeping bag liner (optional), a day pack (most school backpacks will work fine), and hiking boots or shoes. What does a typical day on CRLS look like? The first half of the trip will vary from the second half. During our first five days, students will engage in interactive Spanish classes in the central valley of Costa Rica. Classes will run in the afternoons from about 1-5; mornings will be spent engaged in volunteer projects coordinated with our Spanish school. The second half of the trip will be spent primarily at a hostel near Manuel Antonio National Park on the Pacific Ocean. Students will learn about local ecology, cook authentic Costa Rican cuisine, and explore waterfalls and swimming holes. Students should expect to be up early (around 6:30 a.m.) in order to take advantage of the cooler temperatures in the mornings. All accommodations on CRLS will be indoors in hostels. Sleeping accommodations are fairly rustic, but students should expect to have a bed with sheets and blankets every night of the trip as well as access to running water and showers on a daily basis. Parents can expect a phone call home once on CRLS, usually corresponding with the group’s transit day. Students on international trips will also call home at some point on arrival day, depending on schedules and arrival times. Should I send my child to Costa Rica with an international phone plan or a calling card?